Truth be told, I’m a very visual person. I’m also a very mathematically-oriented person. So being able to visualize math-based things is crucial for me when trying to learn and use something. So when I began studying hand ranges and learning how to exploit various ranges, I created a simple model to help me visualize this stuff easier. And while many things in poker can be complex, I knew my model needed to be simple enough to use in real-time. Which is why I began visualizing poker ranges in pie charts. A pie chart is a simple circle that contains multiple pieces (and each piece looks like a piece of pie! ), and when you add up all the pieces they equal 100% of the circle. So my idea was to look at the entire pie as the complete range my opponent has, and then to chunk that pie into pieces representing different kinds of hand strengths. We see on the right that 63% of that range has a pair or decent draw. And the rest of the range is varying amounts of weakness. If we make a basic assumption that villain folds the weak stuff and continues with the decent stuff, we can visualize their range with a simple piechart. The pie chart model is simple yet powerful as-is, but it’s made even more powerful when we consider densities. Say your opponent calls your CB in this spot. We can zoom into the “call a CB” range, visualize it as a pie chart, and see which pieces of that range are really strong. Would they fold most of those 67 combos to a double barrel? Would they fold any of those 30 top pair combos to a triple barrel? 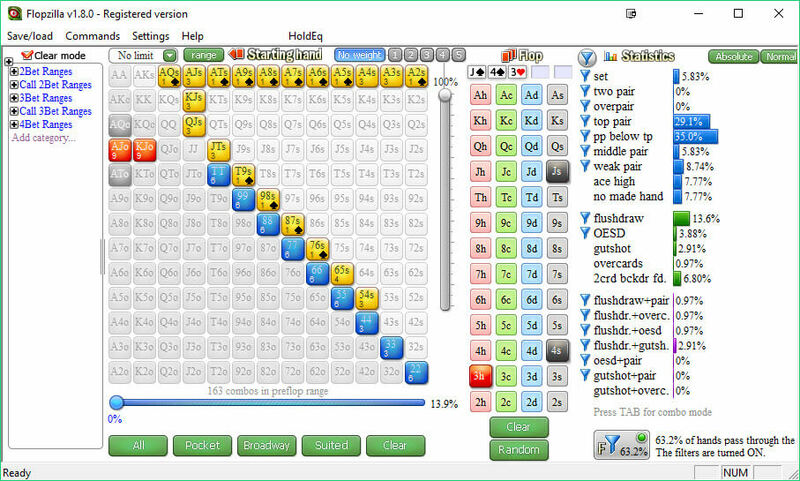 By doing this kind of work you force yourself to think ahead, to gain a more technical understanding of poker, and to begin seeing ranges for what they really are. And the fact that you could visualize the calling range on the flop to be ⅓ top pair and ⅔ marginal/draw holdings gives you a huge leg up when it comes to deciding when to barrel future streets. This model, like any other, requires practice. You need to get familiar with combos, with Flopzilla (or Combonator if you are a Mac user), and breaking down ranges into a format you can use in real-time. Now, visualizing ranges is important. Being close-enough with your combo counts is vital. But to actually use this you need to compare it to something tangible. Continuing with the example from above, if the turn is a K♦, what should you do? Just eyeballing it we can see he’ll have a Jack or better about ⅓ of the time. First, know the breakeven % of your bet. If you bet full pot you make profit if villain folds more than 50% of the time. If you bet ⅔ pot you make profit if villain folds more than 40% of the time. So if you thought villain would fold everything but a Jack or better to a double barrel, you make outright profit so long as you don’t bet way over pot. Awesome! The formula for BE% is simple. Risk / (Risk+Reward) = BE%. Where risk = how big your bet/raise is and the reward is the pot size before you bet/raise. For more on this, watch this math video about breakeven percentages. Heck, even if you thought villain would continue with a Jack or better and any flush draw you still get folds a little more than half the time. Sounds like a good double barrel to me! Let’s review this spot. Villain opens in MP2 and you 3bet from the button with Q♥ 9♥. You think they’d open with 22+/AT+/KJ+/SC and that they’d only give your 3bet action with 99+/AJ+/KQ. Right away we can build a pie chart and figure out how big the folding piece is. Already we can test this against the math and see how often we get outright folds with our 3bet. As played villain calls our 3bet. We can zoom into that 99+/AJ+/KQ range and ask ourselves “well, which of those hands would 4bet?” Because villain just called we can remove the hands that villain would have re-raised us with. So if they would 4bet QQ+/AK we see the calling range is just 99-JJ, AQ, AJ, KQ. Pretty powerful stuff, right? Already we notice that the overcards make up a very large density of villain’s range. So if villain checks to you, and you bet, can you expect to get a ton of folds? I’d say yes against players who don’t float OOP! Don’t worry if this model seems a bit over your head at the moment. The goal is to practice it so much that you get an innate feel for it. And once you get a feel for it – it becomes a million times easier to spot bluffing opportunities, spots where you can value bet thinner, and spots where you can easily ramp up your aggression. If you are looking for the best resource for practicing poker and other hand reading techniques, grab my workbook. It lays out 40 exercises so you can work on hammering down your own ranges, your opponent’s ranges, and even range vs range situations. It’s the homework you need to take your game to the next level and allow you to find more spots to profit in!